<p>Although quantum dots embedded in a film are currently used in LED televisions, this lighting approach is not suitable for widespread use in general lighting applications. Transferring the quantum dots in a liquid allowed the researchers to overcome the problematic drop in efficiency that occurs when nanomaterials are embedded into solid polymers.</p>    <p>Making efficient white LEDs requires quantum dots that efficiently convert blue light to red or green. The researchers carried out more than 300 synthesis reactions to identify the best conditions, such as temperature and time of the reaction, for making quantum dots that emit at different colors while exhibiting optimal efficiency. </p>      <p>&quot;Creating white light requires integrating the appropriate amount of quantum dots, and even if that is accomplished, there are an infinite number of blue, green and red combinations that can lead to white,&quot; said Nizamoglu. &quot;We developed a simulation based on a theoretical approach we recently reported and used it to determine the appropriate amounts and best combinations of quantum dot colors for efficient white light generation.&quot;  </p>     <p>To make the new LEDs, the researchers filled the space between a polymer lens and LED chip with a solution of quantum dots that were synthesized by mixing cadmium, selenium, zinc and sulfur at high temperatures. The researchers used a type of silicone to make the lens because its elasticity allowed them to inject solutions into the lens without any solution leaking out, and the material's transparency enabled the necessary light transmission. 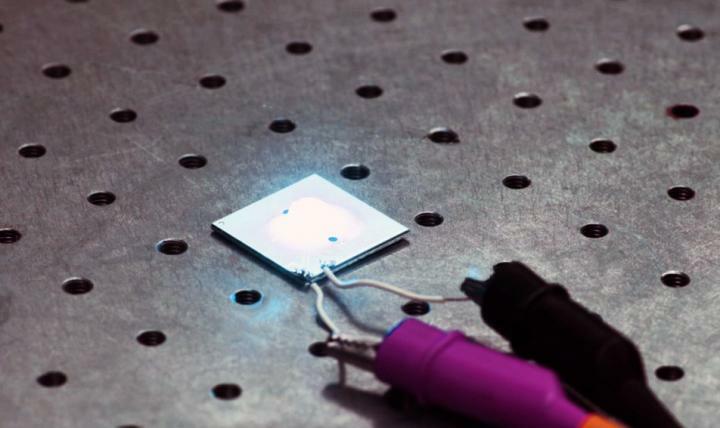 </p>     <p>The researchers showed that their liquid-based white LEDs could achieve an efficiency double that of LEDs that incorporate quantum dots in solid films. They also demonstrated their white LEDs by using them to illuminate a 7-inch display. </p>   <p>&quot;Quantum dots hold great promise for efficient lighting applications,&quot; said Nizamoglu. &quot;There is still significant room for technology development that would generate more efficient approaches to lighting.&quot; </p>      <p>As a next step, the researchers are working to increase the efficiency of the LEDs and want to reach high efficiency levels using environmentally friendly materials that are cadmium- and lead-free. They also plan to study the liquid LEDs under different conditions to ensure they are stable for long-term application.